Here’s a riddle for you: In what situation can the biggest change in a person’s life also be the smallest? Having a baby! 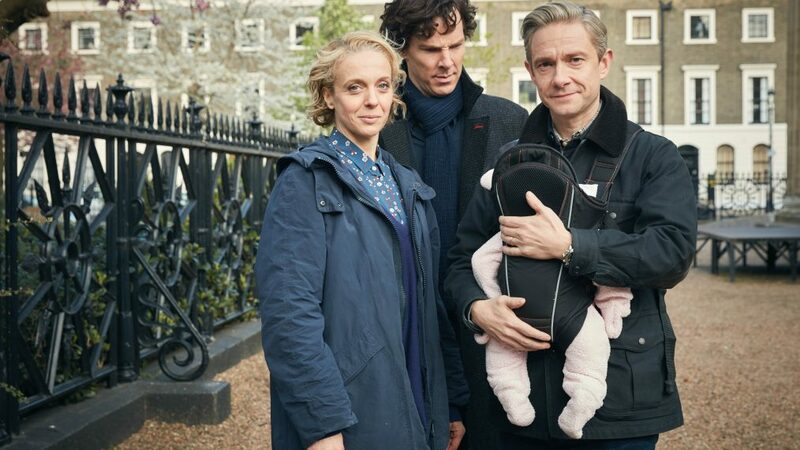 When Sherlock returns after a yearlong hiatus, Holmes (Benedict Cumberbatch), his best friend, Dr. Watson (Martin Freeman), and Watson’s wife, Mary (Freeman’s real-life partner, Amanda Abbington, near right, with Cumberbatch and Freeman), are expanding their trio with the birth of the couple’s first child. Now picture fussy, self-centered Sherlock pushing a pram. It’s not pretty, is it? But neither are the events of the series’ three-episode fourth season. Episode 2 introduces guest star Toby Jones as classic Holmes adversary Culverton Smith, a man whose rotten teeth reflect his dead soul. And the finale is a mind-bender, a nail-biter and a stomach-turner. “This season is our darkest yet, because we put the characters through an emotional ringer,” Gatiss says.